Written and researched by a team of experts, this book is independent in its recommendations and offers suggestions for a variety of budgets. This handy sized pocket oracle is split into sections starting with a Quick Start Guide advising on top sights, a guide to local life, day planners to help you make an itinerary for your trip, valuable need to know tips, and a neighbourhood roundup. The main part of this guide is organised geographically by region, with individual sections detailing an extensive range of sights, places of interest, attractions, restaurants, nightlife, accommodation and any local activities. Information boxes throughout the text give insights into local culture and customs as well as offering suggestions for restaurants and bars and notable shopping opportunities. 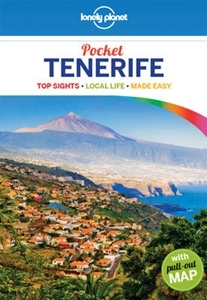 This guide includes coverage of Santa Cruz de Tenerife, El Cuadrilataro, Puerto de la Cruz, La Orotava, Los Cristianos, Playa de las Americas and more. Maps for each area will help you find your bearings while the large pull out map gives you wider coverage of the whole place. Additional chapters highlighting the ‘Best of’ the place looks at the best walks, sights, places to shop, drinking and nightlife and many more things to ensure you don’t miss out on any valuable experiences. The Survival Guide at the back gives advice on things to prepare before you go, what to do when you arrive, how to get around, language tips and other essential information that will help you get the most out of your trip.